In 1985, two adventurous young mountaineers, Joe Simpson and Simon Yates, set off to climb the treacherous west face of the Siula Grande in the Peruvian Andes. They were experienced climbers, and climbed "Alpine-style," climbing the mountain in "one great push," without setting up ropes or base camps ahead of time. After dealing with a snowstorm and some dangerous climbing over powder formations, they reached the summit (about 21,000 feet) on the third day. The climb down proved to be far more difficult. Simpson fell and broke his leg badly. Yates decided to try to lower Simpson down the mountain, one 300-foot section of rope at a time. The climbers had run out of gas to melt snow, so they couldn't risk stopping as night came, and a violent snowstorm began. Their plodding, painful journey hit a snag when Yates inadvertently lowered Simpson over the edge of a cliff. In the storm, the men couldn't hear each other's cries, and, Yates, uncertain as to Simpson's position, and gradually sliding down the slope himself, decided to cut the rope that connected them, sending Simpson plummeting to certain death. Miraculously, Simpson survived the fall, and was faced with the prospect of getting off the mountain alone with no food, no water, and a broken leg. In Touching the Void, filmmaker Kevin Macdonald (One Day in September) tells their story, based on Simpson's book, using contemporary interviews with the two men, and a reenactment of their climb and descent, featuring Brendan Mackey as Simpson and Nicholas Aaron as Yates. 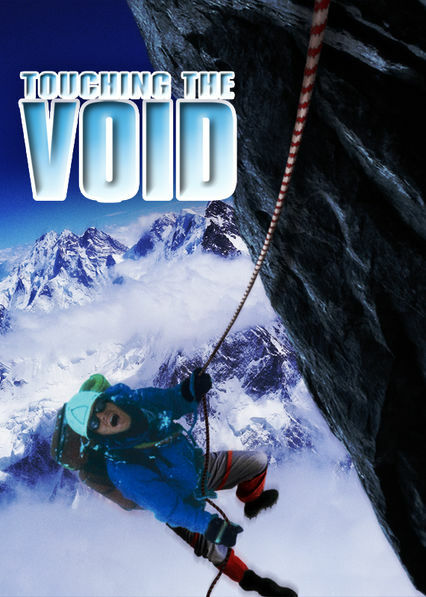 Touching the Void was shown at the 2003 Toronto Film Festival.